6 SHARC passes and pool towels allow you to access the hot tub, indoor and outdoor pools as well as the tubing hill for tons of winter and summer fun. 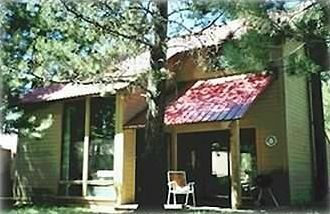 Our Ranch Cabin is located off of Circle four, about one mile from the Sunriver Lodge and the local mall/grocery store. Circle Four is also well known for being centrally located within Sunriver and adjacent to the bike/jogging trail. The cabin is warm, cozy and clean. The interior has been professionally decorated utilizing the original cedar with vaulted ceilings, warm colors, and comfortable furniture. The kitchen is fully appointed including a blender, coffee maker, microwave and JennAir stove. In the winter, the sheets are flannel and the summer sheets are pure cotton. Down comforters finish each bed. The furniture and electronics are up-to-date. The fireplace works at the push of a button for instant atmosphere and warmth. Outside the living room you'll find the covered deck and the gas barbeque, usable year round. The deck opens to the common meadow. The seasonal pool is just a short stroll across the meadow and is only open to ranch cabin guests. We'll provide you with a key, no pool pass to the private pool required. In Sunriver, there is a nature center, observatory, miles of bike paths, and three 18-hole championship golf courses. Mt. Bachelor is a quick 20 minutes away and has some of the best skiing, snowboarding, and snowshoeing in the West. Bend is about 15 miles north of Sunriver, offering shopping, restaurants, and activities that appeal to all tastes! 2 minute walk from the cabin, shared with the Ranch Cabins only! Very cozy and relaxing ! We enjoyed our stay very much. Wish we were able to stay longer. So glad you enjoyed your stay. We'll welcome you back anytime. Clean cute quiet - just what we wanted! We stayed here for the Perseid Meteor shower. Its clean quaint cute and quiet! It has a large amount of sleeping space!!! We only needed for two but could have slept 6 plus! We loved the airflow and the back deck area plus the ease of walking to and from the river and more. We walked to the footbridge to watch the stars. Bring your bikes and you could ride for MILES! This was a perfect home away from home cottage for us. Love it! So glad the cabin worked for you Joel! Come back anytime! This place was absolutely perfect for us. I took my mom and 2 younger kids and it was just right. Kids loved the bunk bed and the community pool was so close - We actually preferred swimming there than at the SHARC. I was worried about there being no AC in the summer but it wasn’t a problem at all. The house had fans throughout to keep everything cool and we spent most of the day outside anyway. Would definitely stay here again. We had a great time in the area and the cabin is well stocked and cozy. It just needed a little bit more cleaning; we could tell Someone before us had a dog-in their bed. Other than that tho the place was lovely and we would stay there again. Thanks Amanda! Our housekeeper works super hard in a short turn around to clean up after guests that don't follow the rules. Thanks for being understanding. We'd welcome you back anytime. Great location, very accommodating cabin. We absolutely had the best time in Sunriver staying at this cabin! The community pool was perfect to spend our afternoons at and there was plenty of trails to walk and explore. The cabin was stocked with everything we needed, dishes and cook ware etc. And the price was reasonable. We would definitely stay there again. We're glad everything was to your liking. We love a well stocked kitchen as well! We enjoyed our stay.The house was very comfortable. Beautiful location. In addition to the initial payment you will receive an emailed confirmation agreement. Guests will add their mailing addresses and sign the confirmation agreement to finalize their reservation.